Chipmunks are usually classified either as a single genus, Tamias, or as three genera: Tamias, containing the eastern chipmunk; Eutamias, containing the Siberian chipmunk; and Neotamias, containing the 23 remaining, mostly western, species. These classifications are arbitrary, and most taxonomies over the twentieth century have placed the chipmunks in a single genus. However, studies of mitochondrial DNA show that each of the three chipmunk groups is about as distinct genetically as genera such as Marmota and Spermophilus. Tamias is Greek for "storer", a reference to the animals' habit of collecting and storing food for winter use. The common name originally may have been spelled "chitmunk" (from the Odawa word jidmoonh, meaning "red squirrel"; cf. Ojibwe, ajidamoo). The earliest form cited in the Oxford English Dictionary (from 1842) is "chipmonk", but "chipmunk" appears in several books from the 1820s and 1830s. Other early forms include "chipmuck" and "chipminck", and in the 1830s they were also referred to as "chip squirrels," possibly in reference to the sound they make. They are also called "striped squirrels", "chippers", "munks", "timber tigers", or "ground squirrels", though the name "ground squirrel" usually refers to other squirrels, such as those of the genus Spermophilus. Chipmunks have an omnivorous diet consisting of grain, nuts, fruit, berries, birds' eggs, small frogs, fungi, worms, insects and on occasions small mammals like young mice. At the beginning of autumn, many species of chipmunk begin to stockpile these goods in their burrows, for winter. Other species make multiple small caches of food. These two kinds of behavior are called larder hoarding and scatter hoarding. Larder hoarders usually live in their nests until spring. 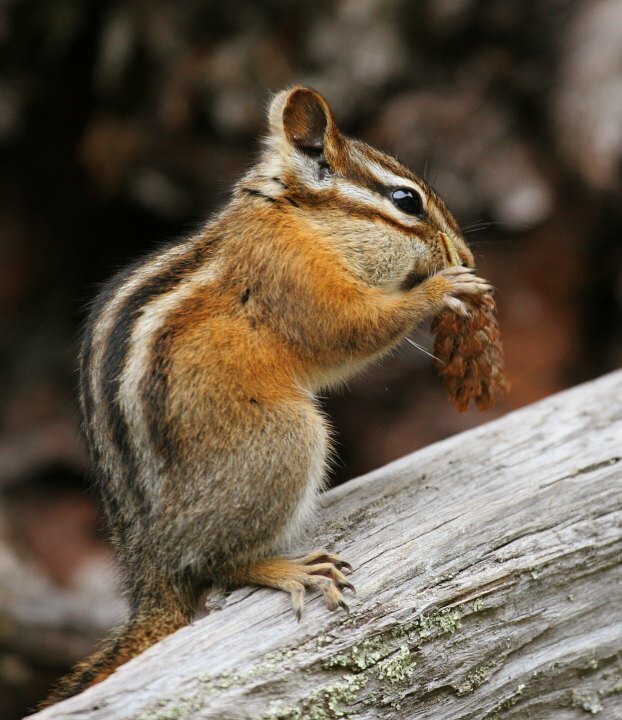 Cheek pouches allow chipmunks to carry multiple food items to their burrows for either storage or consumption. Chipmunks have an omnivorous diet consisting of grain, nuts, fruit, berries, birds' eggs, small frogs, fungi, worms, insects and on occasions small mammals like young mice. At the beginning of autumn, many species of chipmunk begin to stockpile these goods in their burrows, for winter. Other species make multiple small caches of food. These two kinds of behavior are called larder hoarding and scatter hoarding. Larder hoarders usually live in their nests until spring. Cheek pouches allow chipmunks to carry multiple food items to their burrows for either storage or consumption. Eastern chipmunks mate in early spring and again in early summer, producing litters of four or five young twice each year. Western chipmunks only breed once a year. The young emerge from the burrow after about six weeks and strike out on their own within the next two weeks. These small mammals fulfill several important functions in forest ecosystems. Their activities harvesting and hoarding tree seeds play a crucial role in seedling establishment. They consume many different kinds of fungi, including those involved in symbiotic mycorrhizal associations with trees, and are an important vector for dispersal of the spores of subterranean sporocarps (truffles) which have co-evolved with these and other mycophagous mammals and thus lost the ability to disperse their spores through the air. Chipmunks construct expansive burrows which can be more than 3.5 m in length with several well-concealed entrances. The sleeping quarters are kept extremely clean as shells and feces are stored in refuse tunnels. Chipmunks play an important role as prey for various predatory mammals and birds, but are also opportunistic predators themselves, particularly with regard to bird eggs and nestlings. In Oregon, Mountain Bluebirds (Siala currucoides) have been observed energetically mobbing chipmunks that they see near their nest trees. The average sleep time in a 24-hour period of a chipmunk in captivity is said to be about 15 hours. "Those mammals that nap in hiding, like bats or rodents, tend to have longer, deeper snoozes than those on constant alert.